Yesterday was Thanksgiving. I had the good fortune to have a wonderful meal with family and friends. I have to confess that there were moments during the day that I did not feel as thankful as I should have. The day was pure chaos with too many people in too small of a space. Driving home I spent the hour thinking about being thankful in challenging circumstances. I realized that it is human nature not to be as thankful as we should for what we have. I also realized that while the day may have been chaotic, I was extremely thankful to have family and friends to share it with. As a resume writer and job search coach, I interact daily with people who are in some type of transition. Sometimes it is a director who wants to make a career move for advancement, sometimes it is sales rep that has been laid off and frustrated with their job search, or it might be someone working in another field and trying to transition into medical sales or medical affairs. It can be hard to stay optimistic during a job search and even harder to find reasons to be thankful. Even if you are not thankful for what you currently have or where you are in your career, be thankful that you have THE POWER AND CHOICE TO CHANGE IT. Yes, people forget that they control their own destinies and this includes a job search. When searching for jobs, most people do the same thing each day, even if that thing is not getting results. What can you change? More than you think. Not getting responses to your resume submissions? Is your resume reflecting the skills needed to do the job well? How would you rank against the other 300 candidates based on your resume? You can make your resume more effective. Is your resume solid and still not getting interviews? How are you submitting it? Who is actually reading your resume once you apply to a job? Less than 10 of every 500 resumes will be read by an actual hiring manager. Want to improve your odds? QUIT APPLYING ON-LINE AND START EMAILING IT TO HIRING MANAGERS. Are you getting interviews but no job offers? Every interview that does not turn into an offer is a lost opportunity. If you are hearing “we went with an internal candidate” or “we found someone who had the exact experience” more than once, stop and ask yourself why they interviewed you to begin with. The fact is, if you GET THE INTERVIEW THE JOB IS YOURS TO LOSE. That’s right, you were a valid option or they would not have taken the time to interview you. Hiring managers are busy people and do not have time to waste on someone who is not a true candidate. At some point you took yourself out of contention. 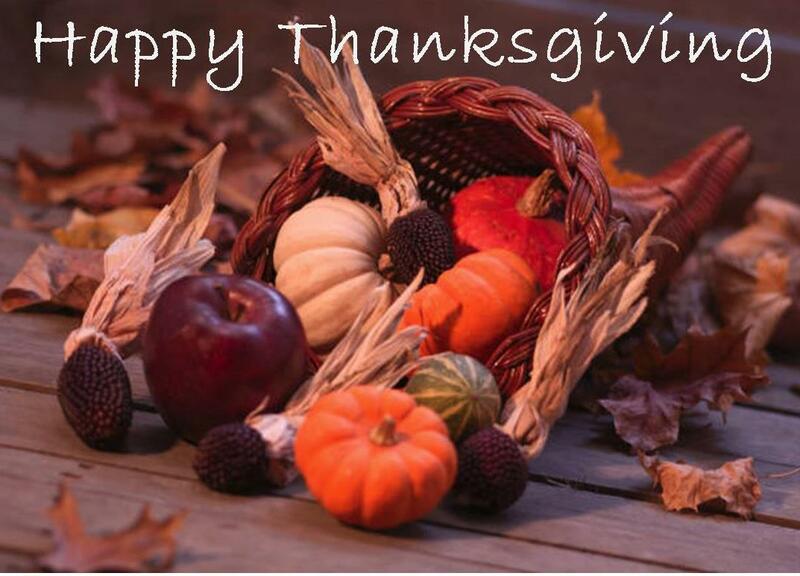 What should you be thankful for? Be thankful that each of the above areas can be fixed so that you can land a job. Poorly written resume? Hire a professional. Look for someone who specializes in your area. Resume not being seen by hiring managers? Quit depending on job postings and start sending it to hiring managers. “Breaking into Medical Sales – Your Guide to Success” teaches you how to do just that. Anyone can follow the very simple steps and conduct a more effective job search. Interviews but no offers? Get coached before you lose another opportunity. A professional interview coach will help you identify the real issue and help you fix it. Important tips for anyone trying to land a medical sales job. Not a day goes by that I am not contacted by a frustrated job seeker who has hit a wall while searching for a medical sales job. If you analyze the steps in your job search, there are three basic areas that people get “stuck”. Don’t get discouraged, each challenge has a solution. Start by identifying which area you are having problems with. I have coached 100s of candidates from all backgrounds who have successfully landed medical sales jobs. Understanding the job search process and how to overcome your specific challenges is essential. 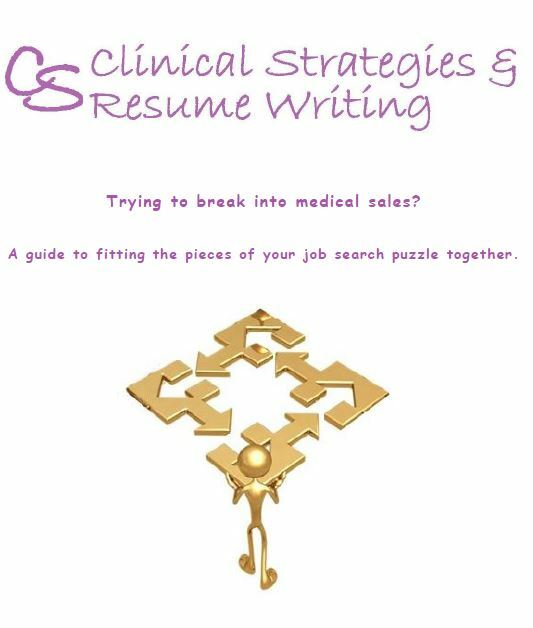 I created the Strategic Guide for Landing Medical Sales Jobs to help job seekers land medical sales jobs faster by overcoming their job search challenges. Issue # 1 – Not getting interviews. You apply to dozens of jobs online and still don’t get called for interviews. PROBLEM: Your resume. SOLUTION: Evaluate your resume and fix it! It has to pass the 12 second test – once the resume is opened you will have 12 seconds or less of the reader’s attention. How do you stack up against the competition (the other 299 people who also submitted resumes)? Issue # 2 – Your resume isn’t being seen by a hiring manager. PROBLEM: Your resume is being screened out during the online application process. You receive automated rejections without a human ever opening the resume. SOLUTION: Send your resume directly to hiring managers. Do not leave your fate up to a computer system designed to eliminate as many candidates as possible. On average less than 10 of every 500 resumes submitted will ever make it to the hiring manager’s desk. Issue # 3 – Getting interviews but no job offers. PROBLEM: You land interviews but continue to get stuck at the same place in the interview process. SOLUTION: If you get rejected after the 2nd or 3rd interview by more than three companies, it is time to get professional interview coaching. Interviewing is not easy. Every part of the interview is crucial. Are you bringing your brag book out at the wrong time? Asking ordinary questions? Not closing? Closing too hard? Identify the issue and fix it before you lose another opportunity. What are your job search issues? Ask Elizabeth, the medical sales job search specialist. Categories: Career Coach, Coaching tips, Interview coaching, Interview preparation, Medical Device Sales, Medical Science Liaison, Pharmaceutical Sales, Resume writing | Tags: breaking into medical sales, Career coach, interview coaching, job search, Job search guide, medical device, Medical sales, pharmaceutical, Pharmaceutical sales, Resume writing | Permalink. I am asked for “tips” on how to break into medical sales on a daily basis. The answer is both simple and not so simple. Landing a medical sales job is a challenge even for experienced reps, which can make landing your first medical sales job seem daunting. The strategies I use in my coaching program are proven effective. Everyone needs a sound strategy to be successful in a job search. I have put together a short electronic guide booklet with tips for breaking into medical sales. It outlines the same strategy I use when coaching clients. It is now free to anyone trying to land a medical sales job. Please email me at elizabeth@clinicalstrategist.com to get your copy today. Categories: Career Coach, Coaching tips, Interview coaching, Interview preparation, Medical Device Sales, Pharmaceutical Sales, Resume writing | Tags: breaking into medical sales, Career coach, medical device, Medical sales, pharmaceutical, Resume writing | Permalink. The job market has changed, has your job search strategy? Five years ago, everyon e searched for jobs the exact same way, by responding to job postings and waiting for someone to call. If you have not changed your job search strategy to reflect the new job market, you are probably going to be looking for a very long time. Is this what your job search looks like? 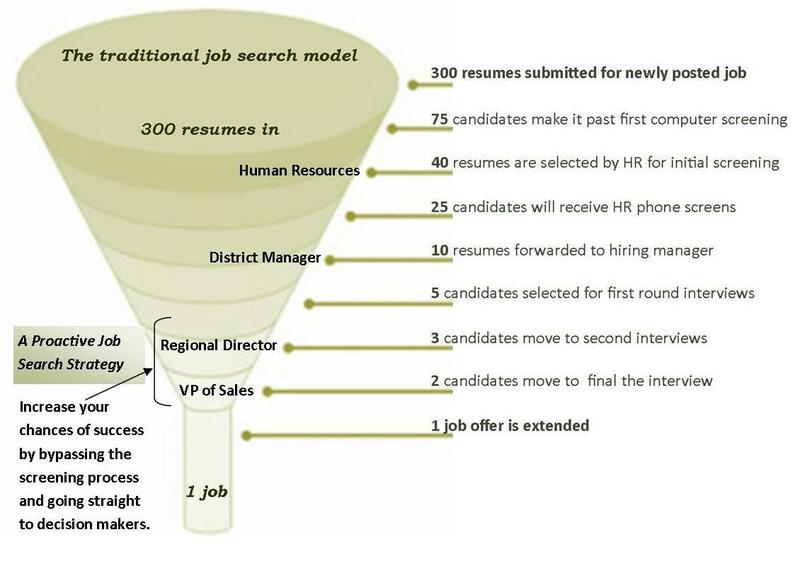 Are you one of the 300 resumes going in the large end of a funnel and hoping that you will be one of the few selected to interview? As you can see, your odds aren’t very good in this model. Most job seekers don’t realize there are other ways to conduct a job search. They simply do what they were taught and what worked in the past. These methods simply don’t work in the current competitive job market. Think of how different your job search would be if you bypassed the initial screening process and sent straight to decision makers. Once you are in a job search, you become a product. Good sales people always sell their products directly to decision makers! Categories: Career Coach, Coaching tips, Interview coaching, Interview preparation, Medical Device Sales, Medical Science Liaison, Pharmaceutical Sales, Resume writing | Tags: Career coach, interview coaching, medical device, Medical sales, Pharmaceutical sales, Resume writing | Permalink.